So, I was driving down the road this week, and you’ll never guess what I saw. Yep- that rotting pumpkin on your front porch. Halloween is over, and even if the little one is in love with Spookly or whatever they’ve named the jack-o-lantern, it has to go! The good news is that those uncarved pumpkins may have some life left in them. 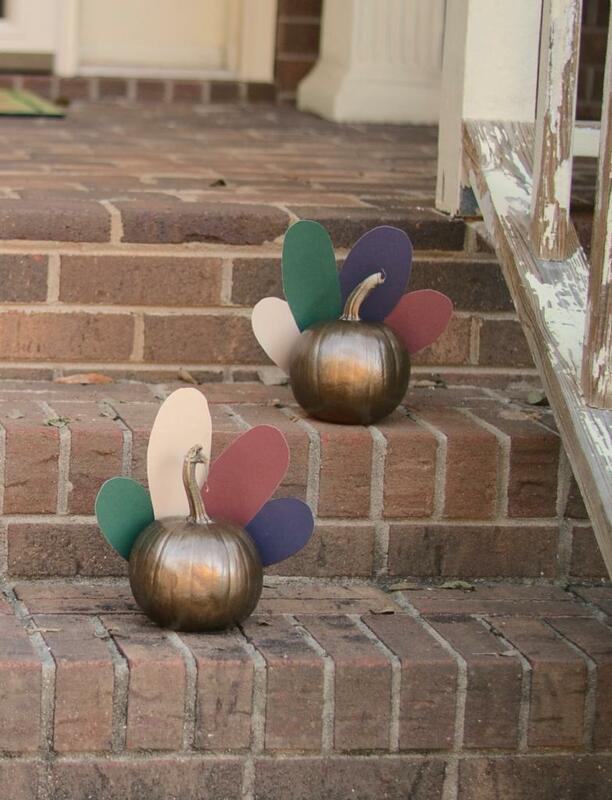 For a fast and easy upgrade, turn those leftover pumpkins into turkey decor. Begin by spray painting the pumpkins. For four pumpkins, I used about 3/4 of a can. It will take a thick coat to cover the pumpkins, but don’t spray it all at once or the paint will run pretty heavily due to the curve of the pumpkins. Let the paint dry. Cut feather shapes from the card stock. Hot glue the feather shapes to whatever you want the back of the turkey to be. The size of the feathers will depend on the size of the pumpkin. 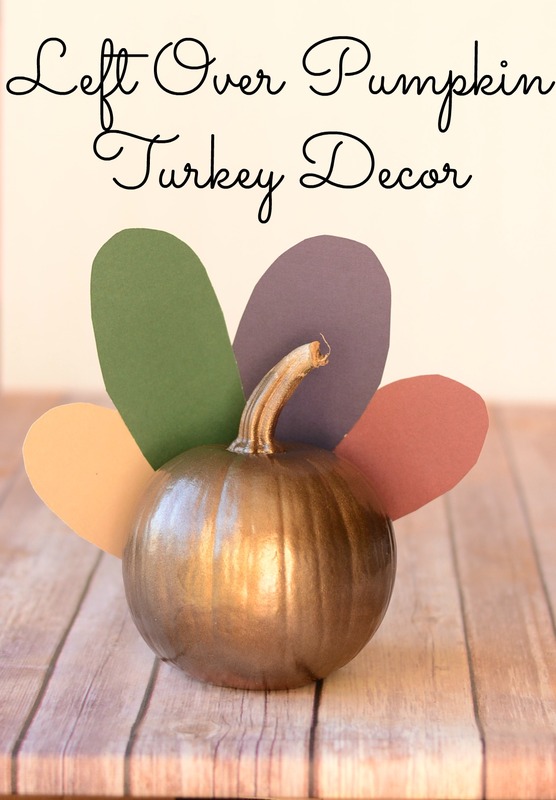 If you’re feeling extra crafty, I’m sure there are other things you could add to the pumpkin to be more ‘turkey-ish’. But for a fast craft that can be done ‘in a blink’, leave it as is! Use as outdoor front porch accents or place on an entry way table for home decor. It Happens in a Blink time table: Allow 10 minutes per ‘turkey’, not including paint drying time. How the Kids Can Help: Since there’s hot glue and spray paint involved, this craft is mainly for the adults. But kids can help by picking out the card stock colors, help draw the feather shapes, and help arrange the feather pattern. Cute, what a good idea! So cute! I love your little pumpkin turkeys. Melanie, these pumpkins are AWESOME! 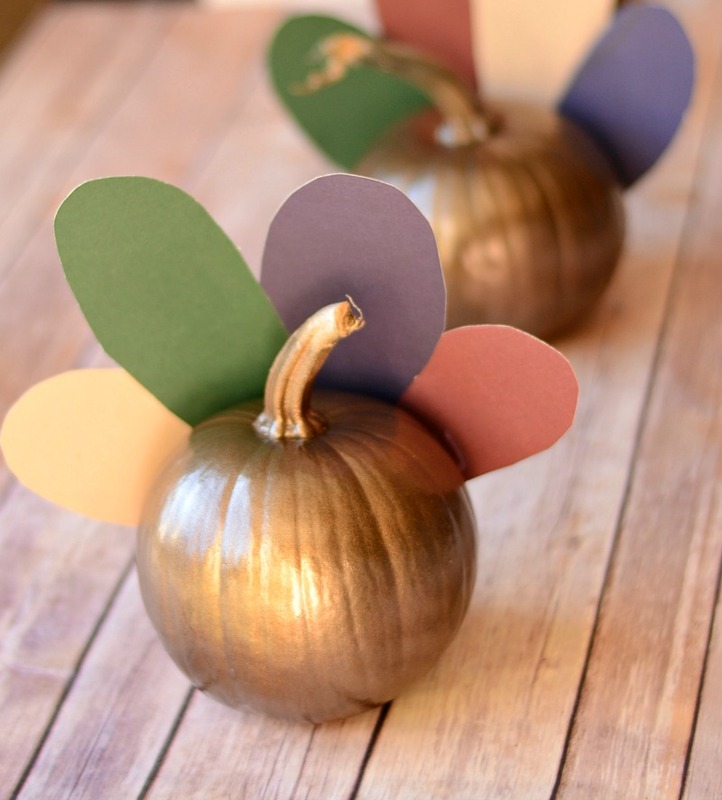 What a clever idea to get more decorating time from your pumpkins!